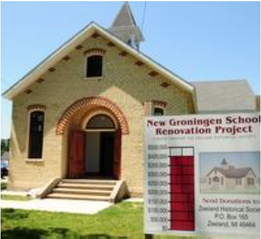 The Zeeland Historical Society has taken a slow, methodical approach to the restoration of the old New Groningen School House on Paw Paw Drive, and the group’s patience and persistence is about to be rewarded. The five-year renovation is reaching the final stages, with a handful of interior details yet to be finished. 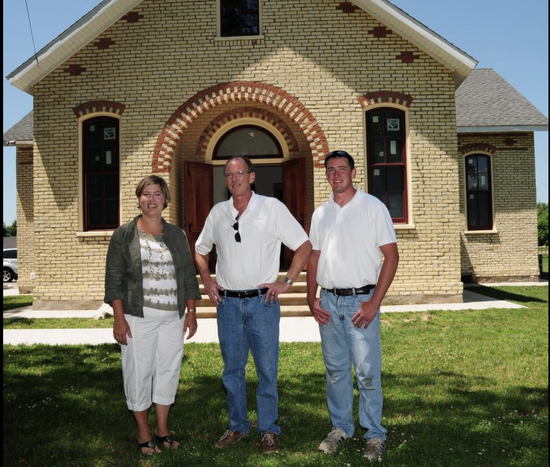 When the $400,000 makeover is complete — most likely by late summer or early fall — the historical society will own an impeccably restored school house that will mirror the original built in 1881, and it will not owe a single penny for the work. The historical society purchased the two-room building and surrounding grounds in 2006 for $155,000. The group has put about $200,000 into the restoration thus far, with about $50,000 to $60,000 left to be raised, Langeland said. The school house served local students until 1951, when the independent New Groningen school district joined Zeeland Public Schools and the existing New Groningen Elementary School was built. For more than 50 years, the former school house has served as a residence, primarily as two-unit rental housing. Made from Zeeland’s well-known Veneklasen brick, the structure has been painted several times over the past 60 years. The historical society’s first order of business once restoration started in 2009 was to strip the paint and restore the brick. Because the brick was covered with lead-based paint, all of the residue had to be collected and disposed of properly, which put the project over budget from the start. “Everything in the beginning started to cost more than we thought, just from what we ran into,” said Neil Ruffner, owner of Neil Ruffner Construction Inc., the contractor for the project. “But the money has been very consistent. They call me every year. This is my third year. After the brick was sandblasted, 21 7-foot exterior windows were replaced and a new entryway — created and donated by Zeeland Architectural Components — was installed. Also on the exterior, an old storage garage was torn down, a new parking lot was paved and a handicap-accessible ramp was built in the rear of the building. Ruffner’s crew also built a new bell tower, which holds the original school bell. Inside, a new basement floor was poured to help combat moisture problems, and the two apartments were gutted to return the school to its original floor plan. Recently, the interior trim work has been completed and the floors have been sanded and await refinishing. Langeland said the end of the project is in sight. Once the restoration is complete and the historical society is given the go-ahead for programming, the school house will be used for entertaining and education. It will be large enough to host receptions that cannot take place at the Dekker-Huis Museum downtown, and it will feature a functioning classroom. Historical society member Dorothy Voss said the society intends to allow local teachers to use the school house as a satellite classroom. “The school room will be used for teachers to come for a part of the day or a whole day and use the space to either do a ‘Little House on the Prairie’ thing, or just go off-site away from their own room,” Voss said.